Ehrlichiosis is a tickborne  bacterial infection,  caused by bacteria of the family Anaplasmataceae, genera Ehrlichia and Anaplasma . These obligate intracellular bacteria infect and kill white blood cells. Anaplasma phagocytophilum (which causes human granulocytic anaplasmosis,). A. phagocytophilum is endemic to New England and the north central and Pacific regions of the United States. Ehrlichia ewingii (which causes human ewingii ehrlichiosis). E. ewingii primarily infects deer and dogs (see Ehrlichiosis (canine)). E. ewingii is most common in the south central and southeastern states. Ehrlichia chaffeensis (which causes human monocytic ehrlichiosis). E. chaffeensis is most common in the south central and southeastern states. Panola Mountain is a 100-acre (40 ha) granite monadnock near Stockbridge on the boundary between Henry County and Rockdale County, Georgia. The peak is 946 feet (288 m) above sea level, rising 260 feet (79 m) above the South River. The South River marks the boundary between Henry/Rockdale counties and DeKalb County, Georgia. Due to its delicate ecological features, Panola Mountain was designated a National Natural Landmark in 1980. Filopodia are slender cytoplasmic projections that extend beyond the leading edge of lamellipodia in migrating cells. They contain actin filaments cross-linked into bundles by actin-binding proteins, e.g. fascin and fimbrin. Filopodia form focal adhesions with the substratum, linking it to the cell surface. Many types of migrating cells display filopodia, which are thought to be involved in both sensation of chemotropic cues, and resulting changes in directed locomotion. Ehrlichiosis is a nationally notifiable disease in the United States. There have been cases reported in every month of the year, but most cases are reported during April–September. These months are also the peak months for tick activity in the United States. Babesiosis is a malaria-like parasitic disease caused by infection with Babesia, a type of Apicomplexa. Human babesiosis transmission via tick bite is most common in the Northeastern and Midwestern United States and parts of Europe, and sporadic throughout the rest of the world. It occurs in warm weather. 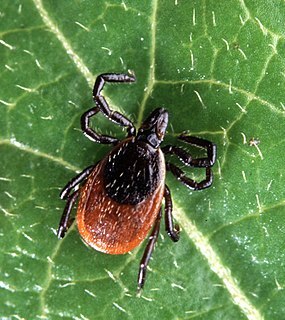 People can get infected with Babesia parasites by the bite of an infected tick, by getting a blood transfusion from an infected donor of blood products, or by congenital transmission. Ticks transmit the human strain of babesiosis, so it often presents with other tick-borne illnesses such as Lyme disease. After trypanosomes, Babesia is thought to be the second-most common blood parasite of mammals, and they can have a major impact on health of domestic animals in areas without severe winters. In cattle the disease is known as Texas cattle fever, redwater, or piroplasmosis. Powassan virus is a flavivirus transmitted by ticks, found in North America and in the Russian Far East. It is named after the town of Powassan, Ontario, where it was identified in a young boy who eventually died from it. It can cause encephalitis, an infection of the brain. No vaccine or antiviral drug exists. Prevention of tick bites is the best precaution. The Heartland virus (HRTV) is a tick-borne phlebovirus of the Bhanja virus serocomplex discovered in 2009. 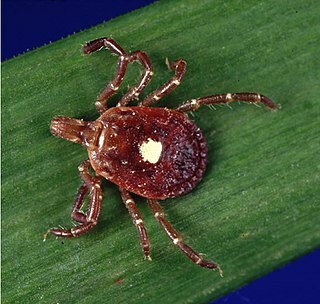 The Lone Star Tick transmits the virus to people when feeding on blood. As of 2017, only five Midwestern United States have reported 20 human infections, namely Arkansas, Indiana, Missouri, Oklahoma, and Tennessee; symptoms resemble those of two other tick-borne infections ehrlichiosis and anaplasmosis. The reservoir host is unknown, but deer, raccoon, coyotes, and moose in 13 different states have antibody titers against the virus. ↑ "Ehrlichiosis". Division of Vector-Borne Diseases (DVBD), National Center for Emerging and Zoonotic Infectious Diseases (NCEZID), Centers for Disease Control and Prevention. 15 November 2013. ↑ Dawson, Jacqueline E.; Marty, Aileen M. (1997). 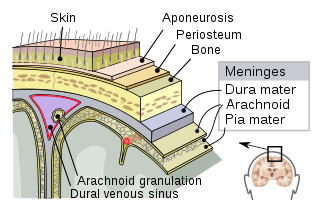 "Ehrlichiosis". In Horsburgh, C.R. ; Nelson, A.M. Pathology of emerging Infections. 1. American Society for Microbiology Press. ISBN 1555811205. 1 2 3 Goddard J (September 1, 2008). "What Is New With Ehrlichiosis?". Infections in Medicine. ↑ Dumler JS, Madigan JE, Pusterla N, Bakken JS (July 2007). "Ehrlichioses in humans: epidemiology, clinical presentation, diagnosis, and treatment". Clin. Infect. Dis. 45 (Suppl 1): S45–51. doi:10.1086/518146. PMID 17582569. ↑ Reeves WK, Loftis AD, Nicholson WL, Czarkowski AG (2008). "The first report of human illness associated with the Panola Mountain Ehrlichia species: a case report". Journal of Medical Case Reports. 2: 139. doi:10.1186/1752-1947-2-139. PMC 2396651 . PMID 18447934. 1 2 Steenhuysen, J. (3 August 2011). "New tick-borne bacterium found in upper Midwest". Reuters. Archived from the original on 2012-06-09. ↑ Thomas S, Popov VL, Walker DH (2010). Kaushal D, ed. "Exit Mechanisms of the Intracellular Bacterium Ehrlichia". PLoS ONE. 5 (12): e15775. doi:10.1371/journal.pone.0015775. PMC 3004962 . PMID 21187937. ↑ Marty AM, Dumler JS, Imes G, Brusman HP, Smrkovski LL, Frisman DM (August 1995). "Ehrlichiosis mimicking thrombotic thrombocytopenic purpura. Case report and pathological correlation". Hum. Pathol. 26 (8): 920–5. doi:10.1016/0046-8177(95)90017-9. PMID 7635455. ↑ McBride JW, Walker DH (2011). "Molecular and cellular pathobiology of Ehrlichia infection: targets for new therapeutics and immunomodulation strategies". Expert Rev Mol Med. 13: e3. doi:10.1017/S1462399410001730. PMC 3767467 . PMID 21276277. ↑ Thomas, Rachael J; Dumler, J Stephen; Carlyon, Jason A (1 August 2009). "Current management of human granulocytic anaplasmosis, human monocytic ehrlichiosis and ehrlichiosis". Expert Review of Anti-infective Therapy. 7 (6): 709–722. doi:10.1586/eri.09.44. PMC 2739015 . PMID 19681699. ↑ Rudoler N, Baneth G, Eyal O, van Straten M, Harrus S (December 2012). "Evaluation of an attenuated strain of Ehrlichia canis as a vaccine for canine monocytic ehrlichiosis". Vaccine. 31 (1): 226–33. doi:10.1016/j.vaccine.2012.10.003. PMID 23072894. 1 2 Dahlgren FS, Heitman KN, Drexler NA, Massung RF, Behravesh CB. Human granulocytic anaplasmosis in the United States from 2008 to 2012: a summary of national surveillance data. Am J Trop Med Hyg 2015;93:66–72. ↑ Drexler NA, Dahlgren FS, Heitman KN, Massung RF, Paddock CD, Behravesh CB. National surveillance of spotted fever group rickettsioses in the United States, 2008–2012. Am J Trop Med Hyg 2016;23–34. 1 2 3 Nichols KH, Dahlgren FS, Drexler NA, Massung RF, Behravesh CB. Increasing incidence of ehrlichiosis in the United States: a summary of national surveillance of Ehrlichia chaffeensis and Ehrlichia ewingii infections in the United States, 2008–2012. Am J Trop Med Hyg 2016;94:52–60.